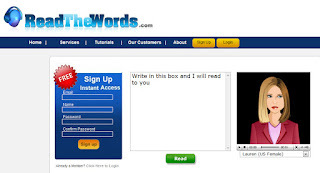 Read the Words is an online text-to-speech generator that you can use to simply read text or you can create recorded text for playback from documents, web sites, or RSS feeds. Once you create an audio file, you can download it (in .mp3 format), embed it in a webpage with a talking avatar, create a podcast, or e-mail it to someone. Read the Words is a useful application for education because audio prompts are useful for many learners; especially ESL students or learners with special needs. If a student has trouble reading independently, you can simply copy and paste text into the box and the text will be read to them. Or, you can upload and convert entire documents or webpages to audio for your students. You can use these audio files on your classroom websites, in PowerPoint presentations, or in SMART Notebook files. Click here to learn more about Read the Words.